From left to right, Dennis Wright, OSCM Secretary-Treasurer; Ed Fitzgerald, Candidate for Ohio Governor; T. Dean Wright, Jr., OSCM President; Duane Lukens, OSCM Vice President; Neil Douglas, OSCM Legislative Agent and Nick Kent OSCM Vice President. 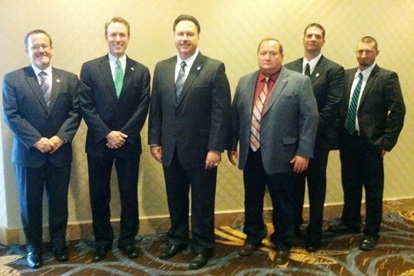 The Ohio State Council of Machinists (OSCM) endorsed Cuyahoga County Executive and former FBI Agent Ed FitzGerald for governor at its fall meeting in Columbus, OH. The OSCM counts 30,000 IAM workers and retirees in Ohio. Fitzgerald will be running against incumbent John Kasich who made his first attack on Ohio working families with an attempt to repeal collective bargaining for public employees shortly after taking office in 2011. SB 5 was soundly defeated by a margin of over 61 percent when voters took to the polls in November.